I am quite certain, dear reader, that you are well aware that life isn’t always a bed of roses. Even when life is sweet, there are always a few dark clouds around. Yeah, I know, I’m mixing my metaphors. So, sue me! Anyway, right now life is pretty sweet. It’s autumn and that means football is in full swing and hockey is just around the corner. Yesterday was a pretty exciting day in the NFL. My beloved Buffalo Bills finally beat the Boston New England Patriots in a very exciting game. I think it was the Bills first victory over the Pats since 2003, and folks, these two teams are in the same division and play each other twice a year. Yikes! That’s a lot of losses to your arch rival, and to finally get a victory feels really, really, really nice. It actually makes up for the Mountaineers losing to LSU on Saturday night. And last night the Steelers managed to limp to a victory over the Colts. It wasn’t purdy, but a win’s a win. I’ll take ‘em any way I can get ‘em. And then there is hockey. The season begins in earnest on October 6, but the preseason is in full swing. The Pens are 3-0 in preseason games and looking great. Evgeny “Geno” Malkin has recovered from his knee surgery and has never looked better. The Pens are so deep that they will have to send some mighty fine hockey players back to Wilkes-Barre/Scranton. I just hope Eric “Big Dog” Tangadi isn’t among them. I really want to see him stay in the Burgh. I think we need his rather sizeable presence in front of the net. And the best news of all is that Sid Crosby is progressing very well in his recovery from last year’s season-ending concussion. He had some set-backs earlier, but now he’s not only skating with the team, he’s scrimmaging with them. Let’s hope that there are no more concussion symptoms and that he will soon be cleared for contact. Maybe he’ll even be back to playing before the end of the year. Wouldn’t that be grand? 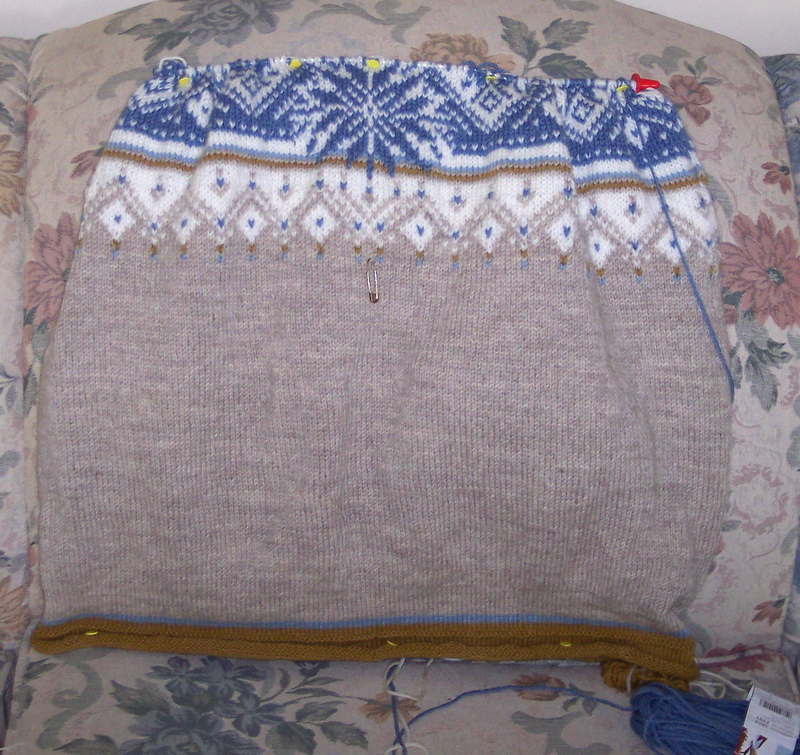 Ages ago, I started one of Elizabeth Zimmermann’s Adult Surprise Jacket. This is a grown-up sized version of EZ’s famous Baby Surprise Jacket (BSJ). 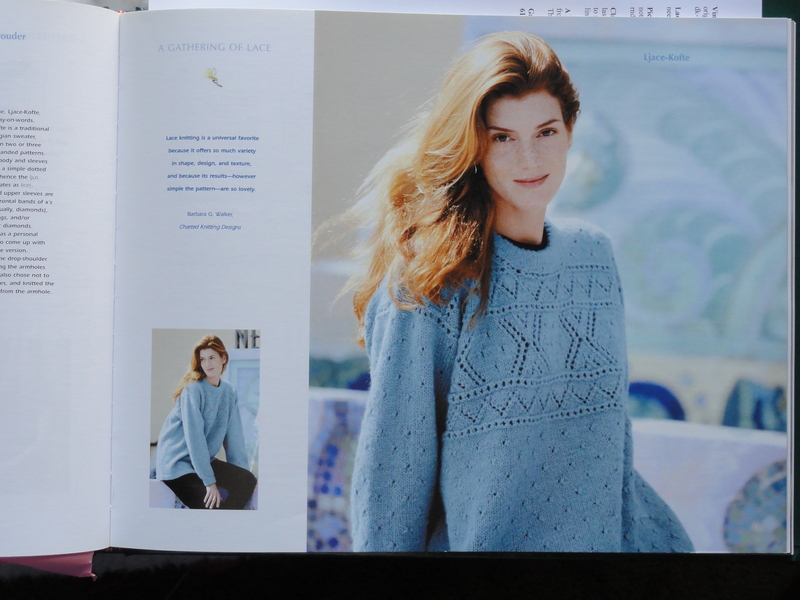 I’ve never made a BSJ, and maybe I should have followed Meg Swansen’s advice–Meg is EZ’s daughter, for those of you who don’t travel in the wonderful world of knitters–and made a BSJ before starting the adult version. The BSJ is an adorable baby sweater; the ASJ is anything but adorable. All that freaking garter stitch in worsted-weight wool?!?!? What’s the word I’m wracking my brain for? Um, ugly. Yeah, that’s the word. Ugly. I started working on the ASJ back on October 1 of 2009. Like a tattoo, at the time, it seemed like a good idea. And I will admit that there are things about the ASJ that are fun. The construction is really ingenious. But it get very boring very quickly. Very. Boring. when I set it aside to knit socks. And there it sat, on top of my knitting basket. Looking forelorn. Making me feel guilty. Day after day. Week after week. Month after month. I just didn’t want to pick it up again. Did I mention it was boring? But I’d gotten this far, and I needed something mindless to work on while watching football and hockey. And endless rows of garter stitch is about as mindless as knitting can get. and I decided to try the sock on. Yikes! It was just a little too tight. Not so tight that I couldn’t pull the sock on and off, but just tight enough that the sock wasn’t comfortable. What’s a knitter to do? I can only speak for myself, but what I did was–you guessed it–rip it out and start over. 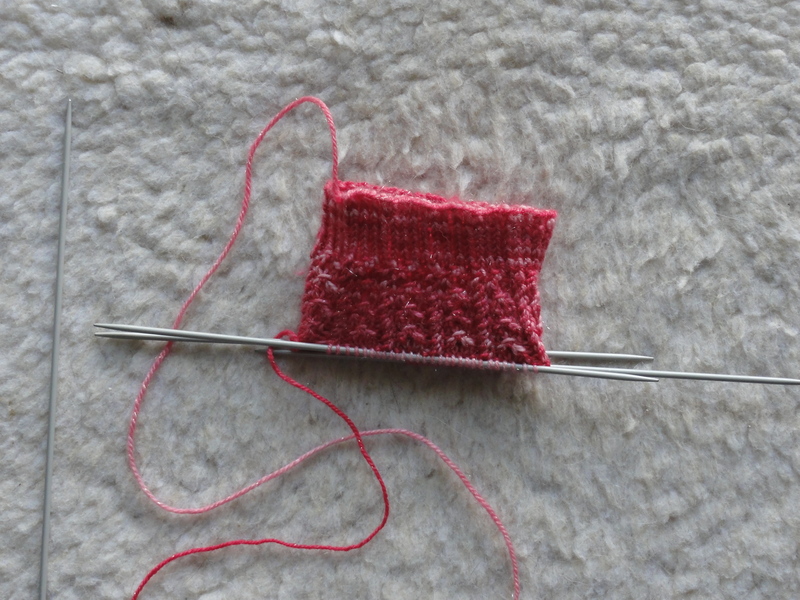 On bigger needles–2.5mm instead of 2.25. What a world of difference a quarter of a millimeter can make. The fabric is much nicer and the pattern looks even better. 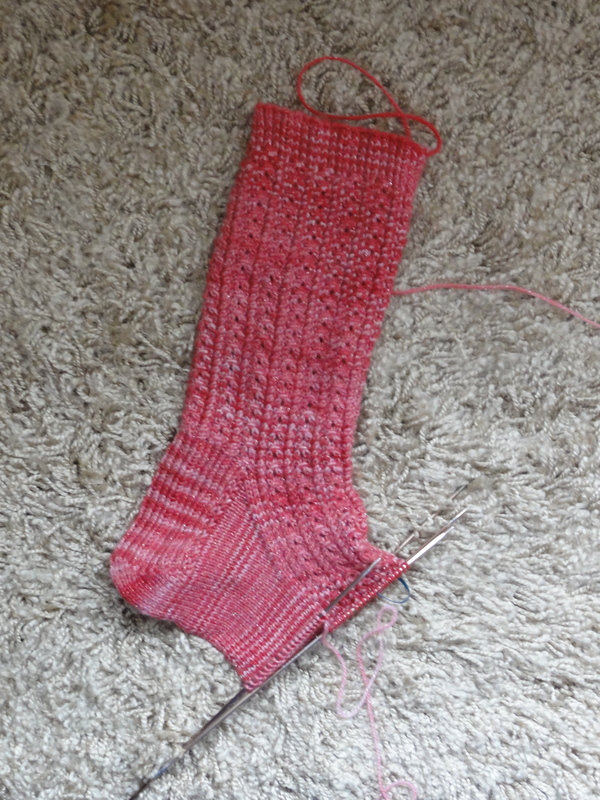 I think the sock will fit this time around, but I won’t know for sure until I have turned the heel and knitted a few rounds of the gusset decreases. Fortunately, I enjoy knitting this pattern, so it isn’t a big deal that I had gotten so far only to have to start over. so as soon as I finish ASJ, I’ll get to work on St. Moritz again. The big question is, can I restrain myself from starting Joan Schrouder’s lovely lace sweater in A Gathering of Lace when the yarn I ordered for it arrives? I was thinking it would make a nice Winter Solstice present for a certain someone, but I doubt I will have enough time to finish it by then if I finish St. Moritz first. Oh, what the hell. St. Moritz has waited this long; what’s another three months? 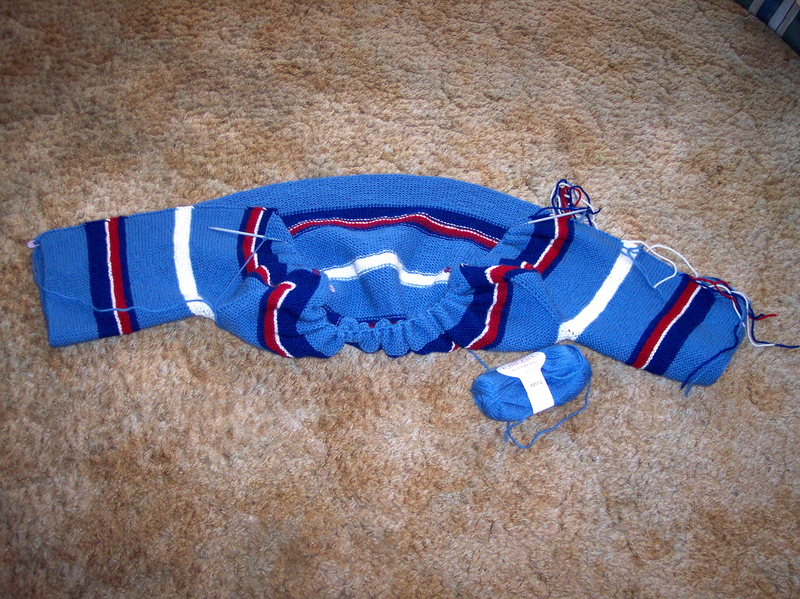 This entry was posted in Knitting, Socks, Sweaters and tagged Adult Surprise Jacket, Buffalo Bills, Dale of Norway, Froot Loop Socks, hand knitted socks, knitting and football, knitting and hockey, St. Moritz, worsted weight wool. Bookmark the permalink. Don’t give up on the ASJ jacket just yet. However, realize that you will need to do a lot of tweaking. Like you, I see EZ as a talented, though utilitarian knitter. And while the fit of the BSJ is o.k. for babies, when you start to enlarge it, the changes that need fixing become abundantly clear. No. 1, the formula using the K 9 number from Schoolhouse Press only works for the number of stitches to cast on. Trash it for stitch distribution and go to 1/4 for each sleeve and 1/2 for the back. That way you will avoid the pencil skinny sleeves and will have a decent depth of sleeve. By the way, my stitch distributioin is exactly what EZ used on her baby sweater if you include the stitches she adds in on row 11 after snugging up the wrist at the begiinning. Somehow Schoolhouse Press missed all of that. If you are using the K 10 figures, your sleeves will be o.k. No. 2, the shoulder seam rolls tremendously to the back, at least an inch or more, depending on how may plain rows you knit between the decrease and the increase rows. If you don’t mind a really broad neckline that rides along the top of your shoulder blades, then go for it. But if you want a neck that fits somewhere in the region of the neck, you have to somehow fill in the upper back neck AFTER seaming the shoulders, and BEFORE doing the button band and neck band together. I love your colors and think you will enjoy the project once finished. But as said above, you will need to do some tweaking. Thanks for your informative comments, Priscilla. I’m certain you are absolutely correct, and I really appreciate your taking the time to explain everything so well. There are two problems with the ASJ that for me are unsurmountable. One is all that freaking garter stitch in worsted-weight wool. I think it is, um, unattractive. The other is that every single method I tried for picking up stitches for the button band and seaming the sleeves looks like utter crap. I tried every method I could find and nothing gave me results that I could live with. I still haven’t decided yet whether to unravel or pitch, but those are the only options I’m considering because I just don’t like this project at all. Q – The St. Moritz sweater is beautiful. Your blogs about the ASJ crack me up!